After one season playing for his former position coach, safety Tom Zbikowski is on the move again. Over the weekend, Zbikowski joined his third NFL team when he signed with the Chicago Bears. The move to the NFC will be Zbikowski’s first year in that conference and will also be a homecoming for the Arlington Heights, Ill. native. 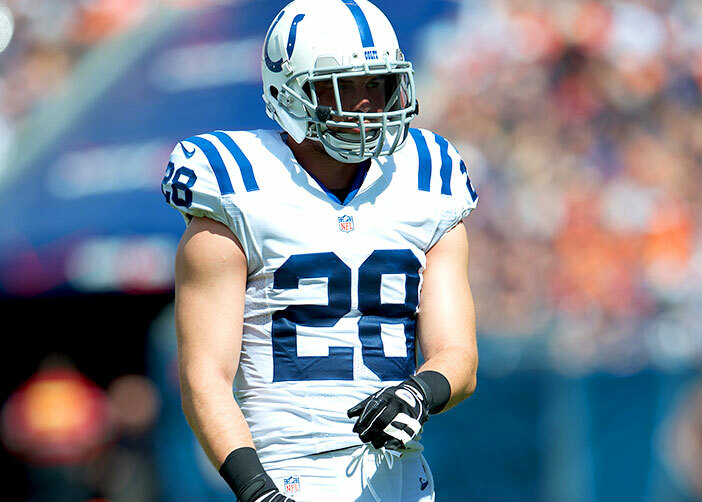 Zbikowski started 11 games at safety for the Colts last season and finished the season with 47 tackles, 1.0 sacks and one interception. During his five seasons in the NFL, Zbikowski played his first four years with the Baltimore Ravens as Colts head coach Chuck Pagano was his defensive backs coach from 2008-2010. The two were re-united in Indianapolis this past season and Zbikowski battled injuries in missing the final five games of the regular season before returning for the playoffs. The 27-year old Zbikowski played collegiality at the University of Notre Dame and has signed a one-year contract with the Bears. For the first time in over a month, the Colts were not celebrating a ‘Victory Monday’ when gathering at the Indiana Farm Bureau Football Center yesterday. Veterans who had been used to treating the past few Mondays as an off day walked into the Colts complex looking to get back to the team’s winning ways. The Colts will wrap up their slate of AFC East games for 2012 on Sunday with the Buffalo Bills coming into Lucas Oil Stadium. For numerous Colts players, Sunday’s contest against the Bills will be the first meeting against them but their offense is comparable with the Patriots. “They have great wide receivers, a shifty running back and a offensive line that plays well together so if we don’t come ready and prepared to play this game the same outcome might occur, but that won’t happen,” Moala said. Even though the Patriots loss was less than 24 hours old, Colts safety Tom Zbikowski was already looking towards the Bills and their offensive scheme. The players will reconvene as a group on Wednesday afternoon to begin the week of practice in hopes of continuing a trend of a resilient football team. Throughout the year the Colts have rebounded from a loss the previous week with a victory the next. Week 12 of the NFL season is no time to start beating yourself up over a single loss and the Colts are straying far away from that with the Bills coming to town. “We just have to make sure that we come in excited on Wednesday, excited to practice, excited to get better and not make the same mistakes that we made on Sunday,” Moala said. Darius Butler sat and watched, waiting for that call. After being cut by the Carolina Panthers on Aug. 31, Butler found himself every Sunday watching NFL games. It took three weeks, but that call eventually came from the Indianapolis Colts. Butler has done more than take advantage of the opportunity, recording three takeaways in his first start last Thursday against the Jaguars. His third quarter interception returned for a touchdown gave the Colts a 21-3 lead and helped keep the momentum with the visitors. He added a game-clinching fourth quarter interception after a Chad Henne pass caromed off a couple Colts defenders. Butler joined the Colts following a Week 3 loss to the Jaguars in which the Colts gave up an 80-yard touchdown in the game’s waning minutes. When Butler walked into the locker room the following week, he was greeted by college teammates from Connecticut in running back Donald Brown and linebacker Scott Lutrus. But it was also the guys in his position group that has made it a smooth transition for the fourth-year pro. “From the first day I got there, guys kind of took me in and helped me out. Guys like (Antoine) Bethea and (Tom) Zbikowski and (Jerraud) Powers just kind of giving me the nuances of the defense. I feel comfortable right now,” Butler said. It will be a bit of homecoming this weekend for Butler as he was drafted by the Patriots in the second round of the 2009 NFL Draft. He played 29 games in his two seasons with New England before being cut during the first month of the 2011 regular season. With Powers being placed on injured reserve on Monday afternoon, the starting spot is Butler’s and he is more than grateful for it.